Thanks as always to The Other McCain for the Rule Five links! Thousands of Central American migrants resumed an arduous trek toward the U.S. border Monday, with members bristling at suggestions there could be terrorists among them and saying the caravan is being used for political ends by U.S. President Donald Trump. A prediction: None of them will take their chances on asylum in Mexico. Mexico isn’t their target. And this is not, say again not a spontaneous march. Think about the logistics involved. 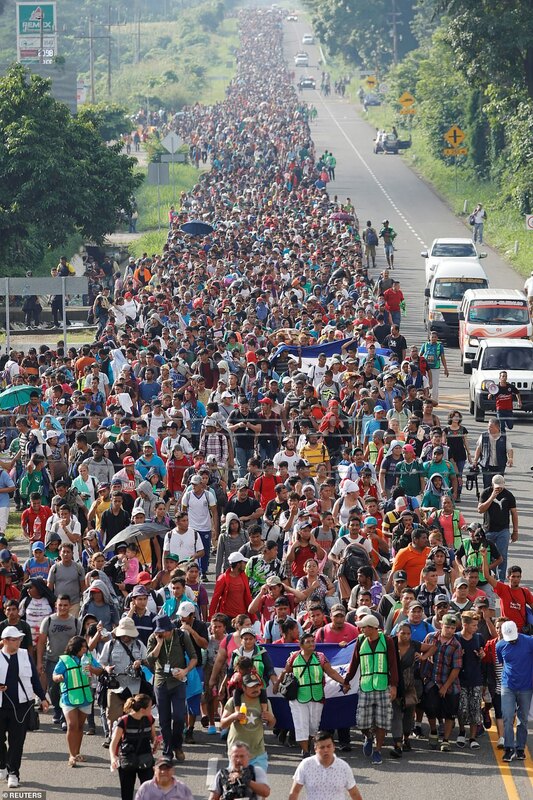 You can’t just assemble 7,000 people and start walking; you have to arrange food, water, sleeping shelters; you have to have financial arrangements made to pay for these things. Someone did that. No, this is a setup. It’s a setup to test President Trump, to test American resolve, and very likely to have an influence on this year’s election. This “refugee” march is a sham. It’s horseshit. It’s a cynical ploy, taking advantage of these 7,000 rubes to make who-knows-what kind of a political statement. And the correct answer on the part of the United States is this: You aren’t getting in. Not like this. Not even one of you.